It is both fantastic and brilliant. There are some nits that might be picked but old fans and new will be too busy blinking back the tears throughout to worry about the dodgy bits. 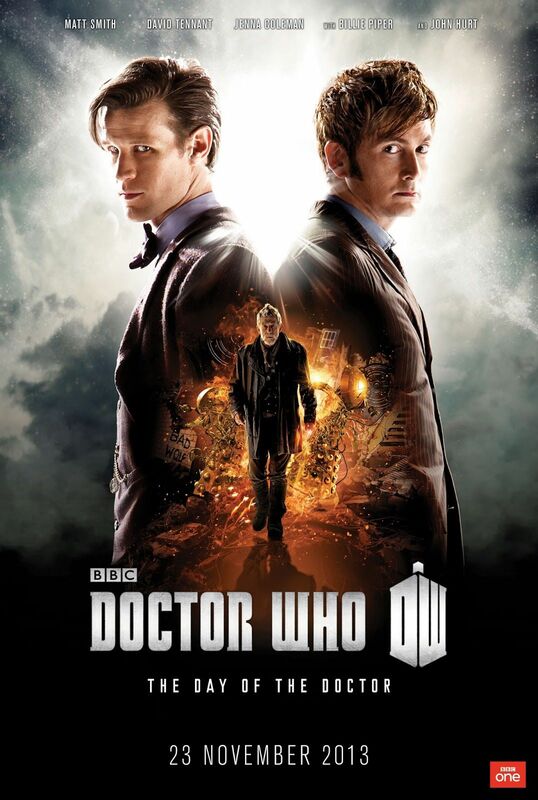 Smith and Tennant get along like a house on fire and John Hurt proves a worthy addition to the pantheon of Doctors. There will be surprises aplenty, mighty sights and great wonders to behold. In short, it is everything we could have hoped for and - for once - when they say nothing will be the same after this episode, they are telling the truth. In Elizabethan England, The Doctor is trying to win free of the amorous of Queen Elizabeth I. He's also trying to avert an invasion by the shape-shifting Zygons. Both tasks are made even more difficult when one of the Zygons begins impersonating The Queen and all The Doctor's cunning proves ineffective in finding the imposter. And in a place very far away and long ago, an old man - once a Doctor - seeks to put an end to the great Time War. Pushed to desperate measures, he has stolen a weapon known as The Moment - a galaxy eater capable of destroying whole races throughout time and space. But unbeknownst to him, The Moment has become sentient and before it will be used, it will test any who dare to make use of it. So in the form of one who is or will be very dear to the one-time Doctor, The Moment shows him images of the men he will become. Three men who are yet one man, united by a name, an ideal and a Moment in Time. They will unite to fight a common enemy and more, to test the very limits of what time can take. Because Time can be rewritten... and even fixed points in time can be broken. * Smith and Tennant play off one another perfectly. The two have a combative relationship similar to the one that existed between Two and Three with the difference being that Smith and Tennant act more like brothers squabbling than bickering colleagues. * Not surprisingly, John Hurt is a fine Doctor. * Lots of nods to the classic series in the background, including a picture of The Brigadier. * For a moment, when The Doctor mentioned stone dust and the covered figures in the Under Gallery were revealed, I thought for sure we were going to see the return of The Weeping Angels. Kudos to Steven Moffat for not bringing his most terrifying creations back when he easily could have. * Jenna Coleman probably has the least out of all the cast to do but she does a remarkable job playing up Clara's cleverness with what little she has to work with. * Billie Piper is similarly hobbled in her role as The Moment, but it is interesting watching her play a character through three filters - The Moment As Rose Tyler As The Bad Wolf. * All The Doctors in the final battle to save Gallifrey. ALL THE DOCTORS!!! * The Curator. Dear gods, The Curator. I don't know if it was a nod to the Shada special, where an older version of The Fourth Doctor is seen wandering a museum devoted towards The Doctor's life... but it was a nice touch regardless. * For once, the phrase "Nothing will ever bee the same again" seems accurate. The revelation that Gallifrey has survived somewhere changes the dynamic of the modern show and gives The Doctor a goal to work toward in the coming series. More, Moffat has managed this without contradicting The End of Time as The High Council was said to have broken off contact with the military, who we see in this episode. Of course that does mean The Doctor will likely have to deal with them later... and it won't be pretty. * The final shot of all The Doctors is a thing of beauty. * What we see of Galifreyian art in this episode doesn't quite jibe with what's been said on the subject in the past. In City of Death, for instance, it was revealed that all Galifreyian art was done on computers. True, the technology to capture a moment in time as a painting probably DOES involve computers on some level but the idea of something flat hanging on a wall seemed utterly shocking to Romana. * The plot with the Zygons is dropped completely after The War Doctor disappears to activate The Moment. It would have been nice to see the final resolution of that thread. Steven Moffat promised this episode would redefine the series. For once, he was telling the truth.